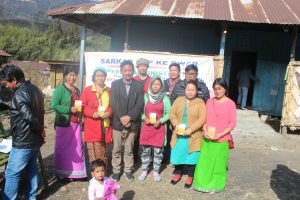 The 15th round of Sarkar Apke Dwar was conducted at Congo village on 04 february ,2019 by the District Administration with all HODs and officials of various Department of Anini . 53 Permanent Residential Certificate (PRC) , 59 ST certificates , 64 Birth certificates, 14 were issued duplicate birth certificates , o3 death certificate were issued , 37 new Adhaar Enrollment , 10 new driving Learners license and 13 received PMUY application form . 02 fresh application issued for Ration card , 10 farmers registered under agriculture department , 05 NCD health card issued , 46 were given NCD health counselling , , 02 new LPG gas connection under PMUY received , Dulary kaniya scheme 03 from were issued . 22 farmers were registered under Horticulture Department. 37 patients attended camp . 21 registration under CM Arogya scheme , 04 under widow pension and 03 under old age pension . 14 persons( owners ) attended the Veterinary Department event , 22 persons were given awareness about schemes of Horticulture Department . Distribution of 40 leaflets packages of mushroom , ginger and organic crops were given to local farmers along with practices of mushroom cultivation , Ginger cultivation and organic farming were shared among farmers .